Comments: Modern Milas carpets have appeared only recently as a result of popular demand from Europe for plainer Turkish Carpets with simple designs. This example is not as plain as most modern Milas carpets with traditional motifs around the border and in the center panel. 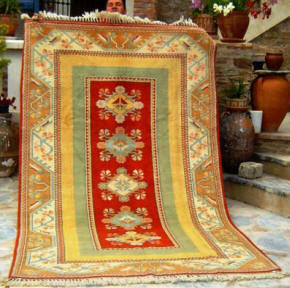 This is a very attractive carpet with a pleasing range of subdued colors typical of the Milas region.